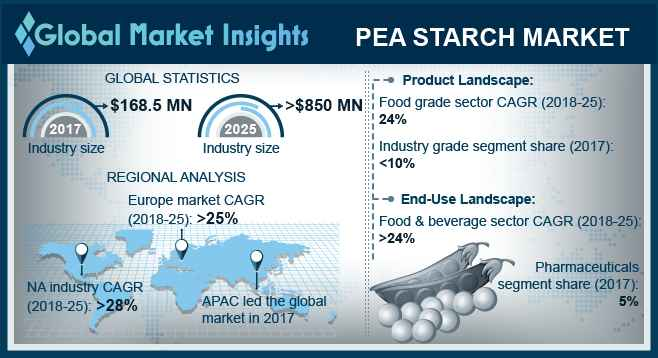 Pea Starch Market size will likely surpass USD 850 million by 2025; according to a new research report by Global Market Insights, Inc. Developments in the North American and European food & beverage industry is likely to be a key growth enabler in the global pea starch market. The product is used as a binding and thickening agent in a wide range of food items. In meat, the product is used to improve texture and mouthfeel for high yield pork hams, poultry rolls, etc. It also provides stability in process conditions for sausages and other processed meats, bakery products, breakfast cereals, etc. Awareness among North American and European population about the benefits of healthy eating habits have resulted in a rise in cooking at home, using natural ingredients and the expansion of online platforms for recipe ideas. This trend is likely to propel pea starch market development as it is available in non-genetically modified, organic, and gluten-free varieties. North America is a major food & beverage market in the world accounting for around 17% of the global retail value sales in 2017. The overall value of food & beverage sales in North America was recorded at USD 270 billion in 2017 and is estimated to reach USD 290 billion by 2021, growing by a CAGR of 1.5%. This large size and steady growth in the food & beverage industry will propel the pea starch market development during the study period. The European food & beverage industry turnover in 2017 was above USD 1 trillion. With around 289,000 companies operating in the region, food & beverage is the principal manufacturing sector in Europe. The number of enterprises in the restaurants & mobile food service industry has also been steadily rising in Europe, led by France, Italy, and Germany. These factors will be majorly responsible for the pea starch market development in the forecast period. According to products, the global pea starch market is categorized as industry, feed, and food grade types. Feed grade segment is likely to gain by a CAGR above 23% till 2025. These products are intended for animal consumption and imparts nutritional value to animal feed items. The main objectives for using it in animal feed products is to be a digestible energy source for animals and for allowing to adapt and improve the texture of the finished product during pelletization and extrusion processes. High growth in global animal feed industry will boost feed grade product demand and will propel the pea starch market development in the study period. According to end-user, the pea starch market is categorized into food & beverage, pharmaceutical, paper & textile, animal feed, and others. Animal feed is a key end-use sector in the pea starch market which is likely to hold a share of more than 10% of the total industry till 2025. Europe is a major animal feed producing region comprising of 20 top feed-producing countries, representing around 70% of the world production. The region also accounted for around 20% of the global compound feed production in 2017. Developments in the European animal feed industry is likely to be a major reason behind the growth of the animal feed end-use sector of the pea starch market in coming years. Europe is a key pea starch market that is likely to grow by more than 25% CAGR in the forecast period. Growth in the region’s food & beverage sector, mostly in countries such as France, Germany, Italy, Spain, and UK, will drive demand for pea starch in the forecast timeframe. Developments in the animal feed industry in the region will also augment product demand for application in pet food and feed items. Steady gains in the European cosmetics as well as pharmaceutical industries will also contribute towards the pea starch market development in the forecast period. Some of the pea starch market participants include Cosucra-Groupe, Roquette Freres, Emsland-Starke, Parrheim Foods, Vestkorn Milling, Meelunie, Yantai Oriental Protein Tech Company, AGT Food and Ingredients, Dakota Dry Bean, American Key Products, etc. Market participants are investing in increasing their pea starch processing capacities and opening new plants to cater to rapidly rising product demand across the globe. Research & development by market players is likely to be a major strategy to gain competitive advantage in pea starch market in the coming years.